Like many other presentation recording solutions, Panopto Focus (formerly Coursecast) captures and automatically synchronises multiple content streams, such as presenter video and a slide show. It does this by making separate recordings of each stream, and keeping track of timing and configuration details in a data file. In addition, Panopto can capture display graphics in full motion, such as a slide show with animated bullets or a software demo. After the recording, the presentation is further enhanced with thumbnails and chapter markers to aid navigation. So what your audience sees is a multimedia presentation in which it is easy to navigate to the topics of interest by clicking on either the chapter markers or thumbnails. When they double-click on either the presenter video or display graphics, they can view that component full screen. Notetaking and search allow viewers to annotate or interact with the programme being viewed. And because the player uses Microsoft Silverlight technology, the presentations can be viewed in any modern browser on Windows, Macintosh or even Linux PCs. One of the strengths of the Panopto Recorder software is device independence. You can record with any audio or video device with is DirectX (WDM) compatible. The Recorder is truly plug-and-play. Panopto Recorder is designed to support either offline recording, such as using a mobile laptop, or online recording with a server connection to automatically upload the recorded programmes. 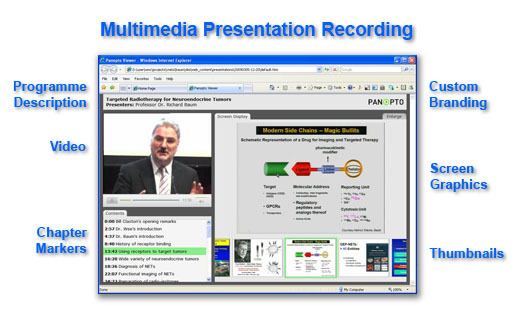 When connected to a server, Panopto Recorder can simultaneously live webcast the recording, and remote viewers can post questions to the presenter. A unique feature of Panopto is the ability to record streams at multiple capture stations and relay them to the same server as part of the same presentation. For example, you might have one machine recording PowerPoint slides and another recording the display of a document camera, a Bloomberg terminal or an online chat amongst members of the webcast audience. The viewer can access these streams - both of which are synchronised to the presenter video - using tabs inside the player. The Panopto Server software includes a variety of content management, scheduling, transcoding, editing and export features. Access control can be based on named accounts or an Active Directory list. RSS feeds are automatically generated for audio and video podcasting. And there is even a plugin for integration with learning management systems such as Blackboard and Moodle. Licensed as a set of software for your capture stations and a server, Panopto Focus is a complete solution for automation of presentation recording in boardrooms, meeting rooms and across an entire campus. The license fee is payable on annual basis, so you can minimise your upfront costs and be assured of continuous support and upgrades. Indicative pricing: This is a server-based solution which has an annual fee. Costs are based on number of capture stations and servers deployed. Please contact us for an estimate.